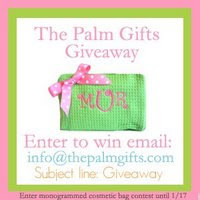 Keeping up with Landree: Monogrammed Cosmetic Bag Giveaway! 3. Visit The Palm Gifts Website and tell us which bag you would design if you won! Include this information in your email. *If you have a blog, please use the photo above and have your blog readers follow instructions PLUS mention your blog in the entry. If the person that wins mentioned your blog, you win too!! The contest will run until 1/17 so HURRY! Jen, I entered to win. At least this time, we could both win! Thanks for telling about it!